Digital printer for tactile effects. 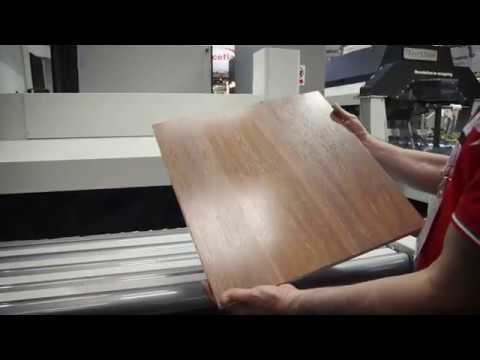 A specific technology enables J-PRINT TD to create tactile effects on the panel's surface. J-PRINT TD can be configured from 1 standard position up to a maximum of 2 positions. Its graphics software enables it to print high definition gray-scale images with its high quality print heads. J-PRINT TD employs a system which circulates the ink through the print heads, thus reducing the frequency of cleaning cycles. The specially designed ink reservoirs and automatic control of all critical parameters including temperature, flow and circuit pressure, assure optimal ink management. J-PRINT TD implements the market leading gray-scale DOD (Drop on Demand) technology as standard supply. Speeds up to 50 m/min. J-Print TD is an innovative, fast, low cost process for digitally printing tactile effects.